Our second-day journey started at 6 AM in front of our hotel. 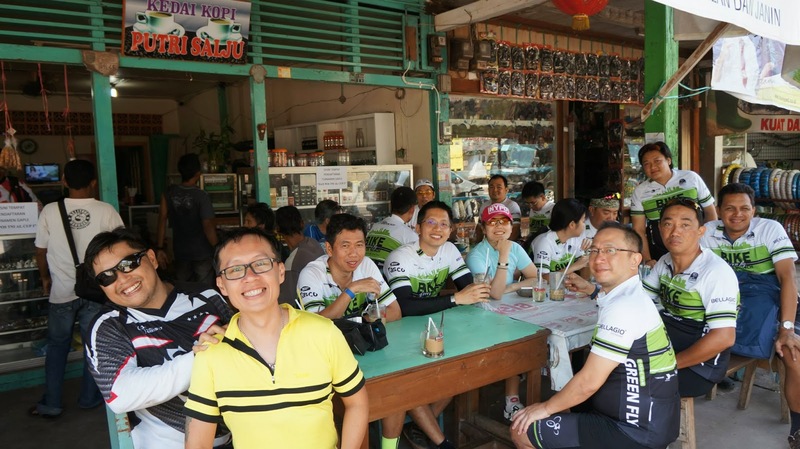 That day, we would ride our bike to Manggar, a city made famous by its many coffee taverns. We planned to stop by at Gantung village to see the set of "Laskar Pelangi" (Rainbow Troops). Apart from the novel that was a major hit and published internationally, the movie was a blockbuster one that won international awards in Italy, Hong Kong, and Iran. On the road, the air was so fresh, and the tarmac was so smooth. Never did I see holes on the streets. The local government did a terrific job in maintaining the road condition. 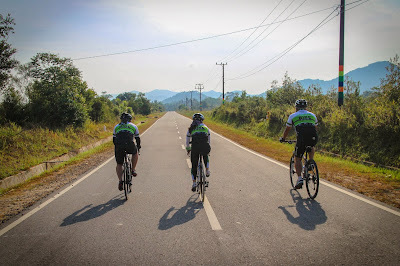 Although the roads were smooth, they were not flat at most parts of the route. 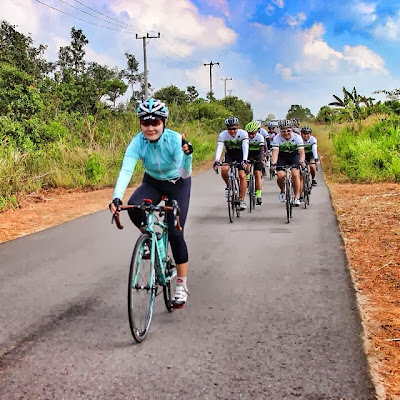 There were many big and small climbs, and in some areas, it was quite steep that riding my MTB was a challenge in comparison with most of the other members, who brought Road Bikes. As the sun rose, I started to feel the skin-burning sensation. As we took a long time on the road from morning to the afternoon, we could really feel the humidity and the hot air. Every time I stopped for a while, I felt the vapor coming out of my body. It was hard for me to keep biking without drinking much water every few minutes. We stopped at Gantung village and took a few photos, including the one in front of the primary school set of "Laskar Pelangi". By then, we had ridden 73 km. 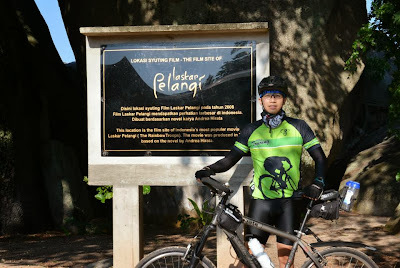 We continued riding our bike to Manggar and reached the city at approximately 12 PM. The total distance we covered that day was 97 km. 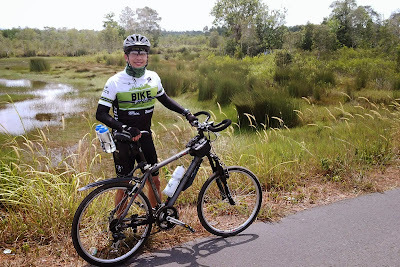 After we had taken lunch, we loaded our bike and drove off. We were curious about the taste of the coffee that made Manggar city famous, so we stopped at a coffee tavern and took a zip. The taste was quite strong and delicious. On our way back to the hotel, we stopped again at a souvenir shop. There were unique souvenirs that I had never seen before. They were the pieces of meteorites that the local people called "Satam". Some also called them Billitonites. 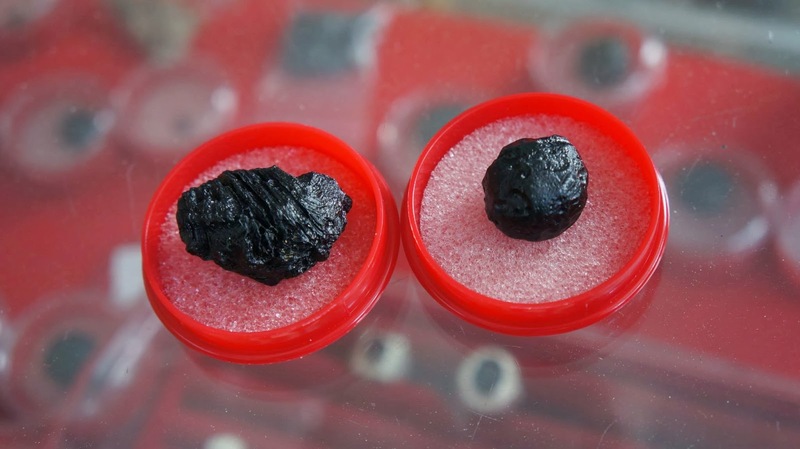 They were shiny, black stones that the miners found while digging the earth for tin. The price was quite expensive. For the size of a small marble, "Satam" was priced IDR 225,000. After the souvenir shop, the next stop was our hotel. We took bath and prepared for dinner. Unbelievably, that evening we went to several places to eat. 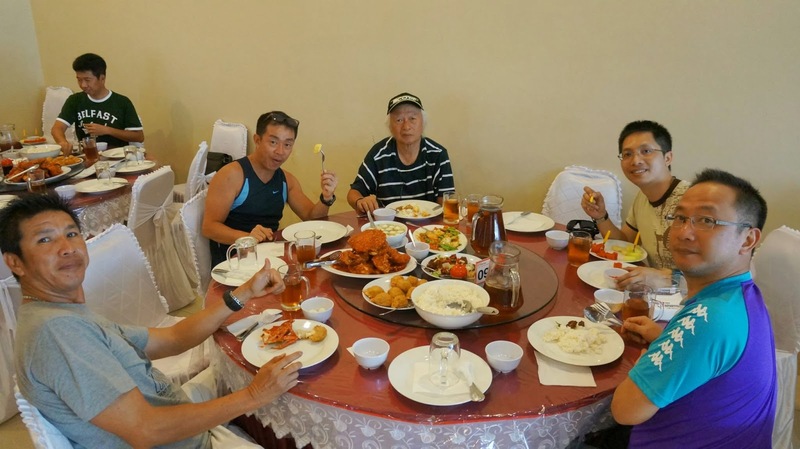 After having snack in a chinese restaurant, we went to a seafood restaurant, and also ate street noodles. It was our last night in Belitung, and we wanted to enjoy it as much as possible. 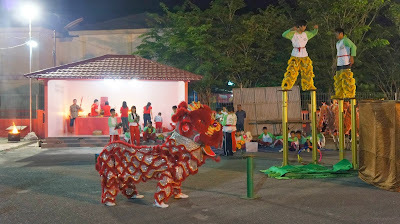 While eating the street noodles, we saw lion dance in a vihara just across the street. Some people were practicing the acrobatic movements on a few high poles. We stayed there for a while and enjoyed the attraction. Although the night was still young, some of us were a bit tired, so we decided to go back to the hotel and rest. Just like the previous day, we started biking early in that morning. A few friends from Belitung Cyclist Team accompanied us on our way to Tanjung Tinggi. It was a 27-km bike ride with many small climbs. 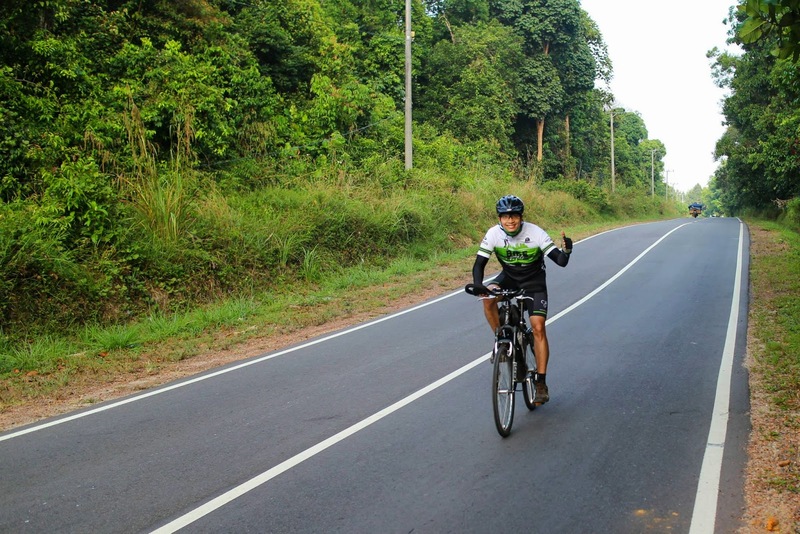 It felt good breathing the fresh morning air, far from the pollution caused by the vehicles. There were many motorcycles in Belitung, but their population were far less than that of big cities such as Jakarta. Soon enough, we reached the place. 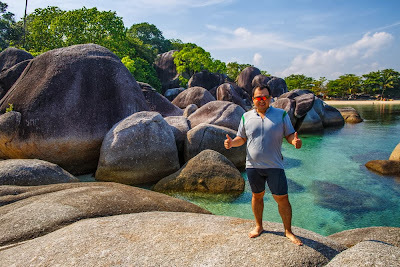 Our Belitung friends bade farewell, and we were on our own, enjoying Tanjung Tinggi. We saw one boulder as big as a three-floor building. 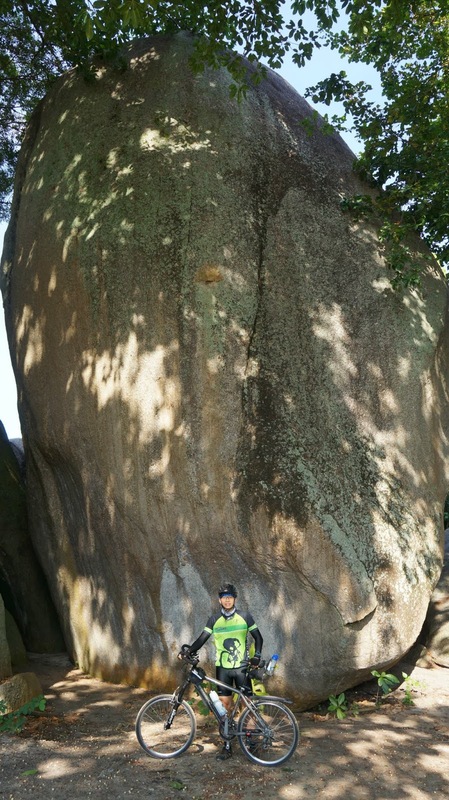 The biggest stone I ever saw. I quickly posed to capture that rare moment. After taking some pictures, we put our bicycles on the truck and rode in cars, back to our hotel. We packed and checked out, as we had to catch the flight in the afternoon. For lunch, we went to a chinese-food restaurant, "Dynasty", and had a delicious meal. On our way to the airport, we stopped by at a small tavern to eat ice. 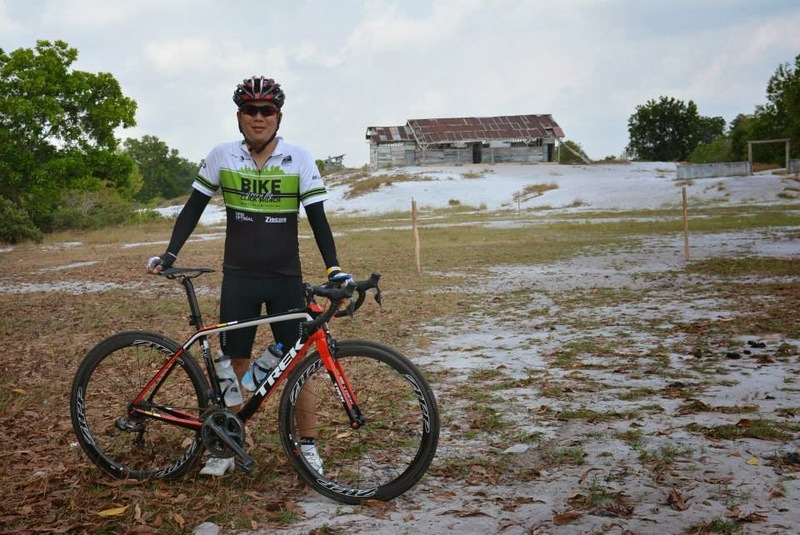 "Satam" monument, Tanjung Pandan city's landmark, and the tavern, were in close proximity. Thus, we quickly took our camera, crossed the street, and posed. By then, we only had a little time to catch the boarding time. So, we hurriedly went to the airport. Our flight back to Jakarta was on time, and we left the island at approximately 4 PM. 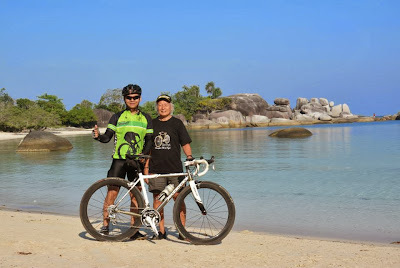 It was a memorable trip for all of us, and we looked forward to having another bike adventure soon.